After years of experience, we eveloped a new model base on our legendary reliable precision automatic tapping machine, called Numerical Control High Speed Auto Tapping Machine. It features the reliability from its predecessor and the technological advancement of today. The new model has better precision and output capacity and its interface is more users friendly. 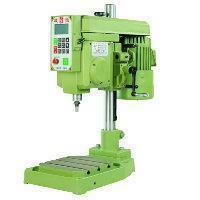 The machine has a precise pitch gear, enable one cycle of spindle feed one pitch of screw thread. Under operation, to prevent work picecs from rotation with simple jig, the work picec will not pulled up. New model is equipped the new & highly efficient motor with 2,000rpm (60Hz) high spindle speed which can operate up to 60 cycle per minute. Operator can easily enter pre-select times or choose one of 3 mode (Inching, Single cycle, Repeat cycle), through its dual language text display in Chinese or English. In addition to its user-friendly interface, the minimum range of adjustable spindle is set at 0.2mm for the precision and conveniences of blind hole tapping and tapping depth adjustment. Safety clutch device in the machine will have the spindle stop when taps sense resistance or the diameter is too small. This security device can reduce damage of taps and work pieces. When the machine detects unusual condition, the machine will stop promptly and the monitor will display error messsage. Twice feeding pattern: Spindle will repeat one time after feeding and reversing back. Phase feeding pattern: Spindle will operate like feeding pattern of removing fur. Externally connected origin pattern: By receiving external connected signals, spindle will feed and reverse between stroke and externally connected origin device. Counting operation mode: Machine will stop automatically when output meets pre-select quantity. Our machine provides multiple fo in and output signal for on-line function, which can complete multiple automationized on-line operation flow.